Just had this posted on Beyond Chron. Another great thing the VHA is doing in collaboration with other great organizations. Presenters and participants at the “Counseling Veterans at Risk for Suicide: Safe Storage of Firearms and Other Lethal Means” conference included former military personnel who have contemplated or even attempted suicide, the parents of a young soldier who succeeded, mental healthcare professionals, suicide prevention researchers, and three firearms dealers. All agreed that one way to reduce the number of veterans killing themselves (now estimated at 22 a day nationally) is to promote safe storage, an approach backed by public health researchers and mental health clinicians. 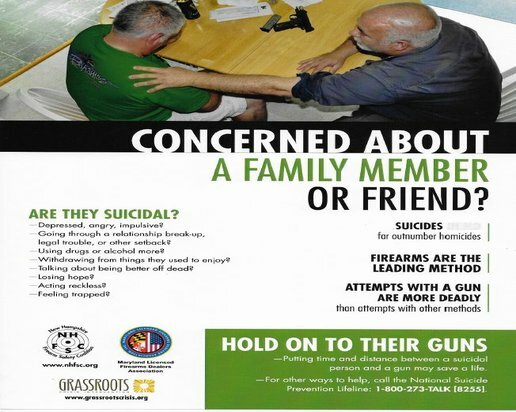 In her introductory speech, Christine Moutier, MD, Chief Medical Officer for the American Foundation for Suicide Prevention explained that suicides are now the tenth leading cause of death in the US, with firearms the means of choice in half of successful attempts. Psychologists Caitlin Thompson, the national leader in suicide prevention for the Veterans Health Administration, and Megan McCarthy, the Lethal Means Safety Coordinator at the SFVHCS explained that while the suicide rate for older veterans is the same as their counterparts in the general population, the rate for younger veterans from the wars in Iraq and Afghanistan is higher. Seventy percent of all the veterans who succeed in taking their own lives do so with firearms. Jean and Howard Somers, mother and father of one of these veterans told the story of their son, Daniel Somers, a Sergeant in the California Army National Guard. In 2013, after years of coping with the aftermath of numerous traumatic brain injuries and Post Traumatic Stress Disorder (PTSD) acquired during multiple combat missions in Iraq, he wrote his parents and wife that he was he was, “Too trapped in a war to be at peace, too damaged to be at war…. My body has become nothing but a cage, a source of pain and constant problems.” He took his firearm and ended his life. Once out of the service, Zimmerman continued, veterans may, be reluctant to go into counseling or report a mental health problem or suicidal thoughts because they erroneously believe their weapons will be taken away from them. They and their families will then be unprotected from threatening strangers, which many report to be the primary reason they own firearms. To reduce the threat of suicide in a population committed to gun ownership is therefore a challenge. One that can be addressed, conference participants argued, by promoting the safe storage of weapons. Catherine Barber, Director of the Means Matter project, at the Harvard School of Public Health’s Injury Control Research Center, explained that many members of the public believe that people who try to kill themselves will find a way or to succeed. Scientific evidence, she explained, dispels this myth: Suicide is usually an impulsive act and only 10% of those who attempt to kill themselves will go on to later die by suicide. Over and over again, Barber outlined the facts; reducing access to the most lethal means reduces the overall suicide rate. In Sri Lanka, for example, banning the pesticides that were most toxic to humans (the method of choice for a rural population) reduced the overall suicide rate in that country by 50%. In England and Wales, when non-toxic gas replaced toxic gas in ovens, suicide rates dropped by 30%. In 2006, when the Israel Defense Forces (IDF) required service members to store their weapons on base when they went on weekend leave, the suicide rate dropped by 40%. For good reason then, suicide prevention advocates and researchers want veterans in crisis to leave their guns with friends, or store them at shooting ranges, or in safes in their own homes. To encourage veterans to do this, of course, involves asking them the right questions, in the right way, and at the right time. To make sure this happens, the VHA has funded Megan McCarthy, PhD and her colleagues at the SFVAHCS – in collaboration with the Harvard School of Public Health Means Matter project — to develop a pilot project to train mental health providers in Lethal Means Safety Counseling. Even seasoned mental health professionals, McCarthy told the audience, need to understand that directly telling a veteran he or she shouldn’t have access to a firearm during a crisis will not work as well as guiding the veteran to think about how to keep himself safe when things look unremittingly bleak. The training has been piloted in San Francisco as well as at the VHA in Northern California and four VHA facilities in Pennsylvania, and will be disseminated in other VHAs this year. It’s a shame that so few members of the media who had been invited attended the conference. The mainstream media seems only interested in reporting negative stories about the largest, and only integrated, publicly funded health care system in the US. As a result, there have been few media reports on the many research studies documenting the high quality of VHA care for those who have access to it. For example, a recent national study of suicides that occurred between 2000 and 2010, documented that veterans who used VHA services had reduced rates of suicides, while veterans not utilizing the VHA had increased rates. Moreover, veterans who seek mental health treatment at the VHA receive care that is far superior to the services offered in the private sector. Veterans who don’t know the facts, however, may not seek treatment from the one healthcare system that – when properly funded by Congress– is best equipped to help them.